A Marked Improvement: False Marking and the AIA, The Federal Lawyer, Jan-Feb 2015. Elisabeth (Bette) emphasizes strategically addressing her clients’ current issues and identifying future ones before they become a problem. She practices in Merchant & Gould’s litigation practice group. 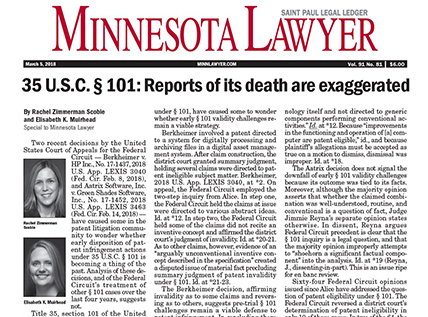 Working out of the firm’s Minneapolis office, Bette’s practice centers around patent litigation and appellate work. 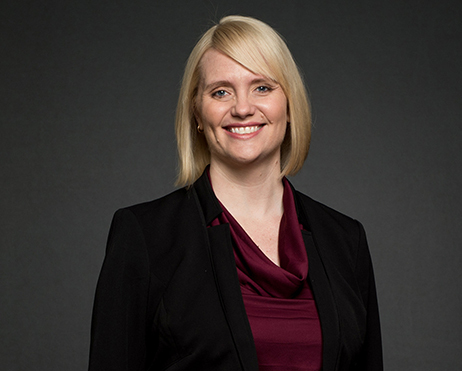 Bette approaches each client with the goal of creating and pursuing smart strategies to protect and further the client’s intellectual property portfolios. With each new issue or challenge that arises, she looks at every angle before counseling on the best available solutions. For Bette, it is never just about resolving the most pressing issue. Instead, it is about taking a long-term approach to litigation; she ensures the steps she takes today supports her clients’ future goals and needs. Additionally, Bette has a keen ability to quickly identify the right answers for her clients’ many questions. This skill proves invaluable to clients as they continue to create and build their IP portfolios and their businesses. Bette began her career not as a lawyer, but as a biologist and environmental chemist. She sought a biology degree from the University of Puget Sound in Tacoma, Washington, before pursuing an M.S. in Environmental Chemistry from James Cook University in Australia. Her educational pursuits led her quickly into the field of medical device manufacturing. After working for Beckman Coulter, a leading research and discovery firm, Bette wanted to take her career further while also pushing herself to new heights and challenges. This led her to the University of Chicago Law School, where she combined her passions for science, logic, and educational excellence. After law school, Bette clerked for the Honorable Joan H. Lefkow of the U.S. District Court for the Northern District of Illinois. There, she honed her writing and analytical skills and gained practical knowledge in the ins and outs of litigation in a federal district court. Bette has always led an active lifestyle, ranging from participating in crew to playing intramural soccer and volleyball in college and beyond to now being a certified rescue (SCUBA) diver. She also loves to travel, which she does with her husband and stepdaughter. A true Minnesotan, Bette loves to spend time at the lake with her family.